Complete case studies are available to ipSpace.net subscribers. Select the Case studies tab after logging into the webinar management system. Some of the case studies have a detailed description on our web site (see below), for the current list of all case studies, follow this link. Large multi-homed content provider has experienced numerous brownouts in the Internet edge of its data center network caused by high CPU load on the Internet edge routers following a link or EBGP session loss. Central IT department of the government of Genovia is building a new private cloud which will consolidate workloads currently being run at satellite data centers throughout various ministries. The new private cloud should offer centralized security, quick application deployment capabilities, and easy integration of existing application stacks that are using a variety of firewalls and load balancers from numerous vendors. The data center networking team in a large enterprise (the Customer) has been tasked with building the network infrastructure for a new private cloud deployment. They approached numerous vendors trying to figure out how the new network should look like, and got thoroughly confused by all the data center fabric offerings, from FabricPath (Cisco) and VCS Fabric (Brocade) to Virtual Chassis Fabric (Juniper), QFabric (Juniper) and more traditional leaf-and-spine architectures (Arista). Should they build a layer-2 fabric, a layer-3 fabric or a leaf-and-spine fabric? In a network with two data centers connected with a layer-2 DCI link, implement optimal route advertisement toward enterprise WAN and Internet that survives failures of individual links, node, or subsystems, and avoids split-brain scenario or traffic blackholing. A large enterprise (the Customer) has a WAN backbone based on MPLS/VPN service offered by a regional Service Provider (SP). The traffic in the Customer’s WAN network has been increasing steadily prompting the customer to increase the MPLS/VPN bandwidth or to deploy an alternate VPN solution. The Customer decided to trial IPsec VPN over the public Internet, initially as a backup, and potentially as the primary WAN connectivity solution. 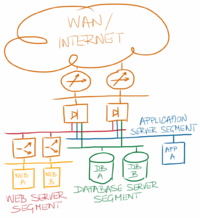 In a network with two data centers (connected with a layer-3 DCI link), ensure the Internet users reach applications running in a data center even if all its Internet links fail. ACME Inc. has a data center hosting several large-scale web applications. The networking engineers designing next-generation data center for ACME would like to replace the central firewalls with iptables deployed on application servers, but are reluctant to do so due to potential security implications.